Modafinil is a “eugeroic” drug used to promote wakefulness and alertness without causing impairment or change in mood. It is typically sold as in tablet form for sale as a regulated pharmaceutical but counterfeit pills have been sold. 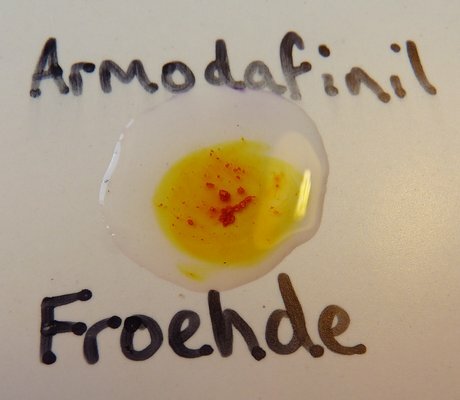 Modafinil is occasionally sold as an enantiomerically pure preparation and is called armodafinil in this case. The difference is the same as amphetamine and dexamphetamine. Modafinil reacts with the Froehde reagent to give a bright yellow. The crumbs of tablet go an intense orange-red due to the higher concentration. 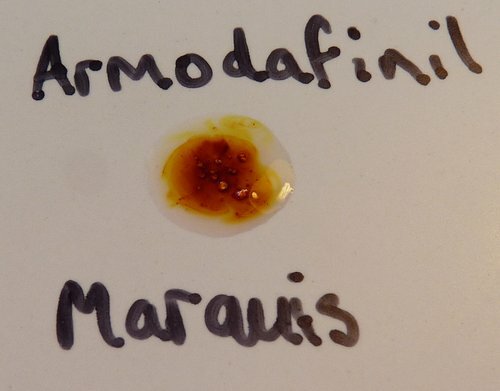 The Marquis reagent gives a brownish yellow reagent which is less vibrant than that of the Froehde reagent.